At Tel Issachar are ruins of an ancient Canaanite and Israelite city, located on a mound on the north bank of Issachar brook (Wady Esh-Sheh), 6km north east of Beit Shean. It is also known as Tell Esh-Sheh (Arabic: "the mound of the nest") and by the name Tell Zeba (Zeba is a girl name meaning in Arabic graceful). The city was one of the Biblical places of the tribe of Issachar. The site is located to the west of road #90, about 6km north of Beit Shean. Follow the sign of Doshen farm and drive along the road to the quarry. The summit of Tel Issachar is located at the height of -196 under sea level, 5-7m above the north side and 10-12m above the Issachar brook on its south side. On Tel Issachar was an ancient city, inhabited from the Early Bronze (Cannanite) to the Iron (Israelite) period. This ancient city, marked by a red square in the map below, was located close to the major city of Beth Shean. It was probably one of the towns linked to Beit Shean, as described in the Bible (Judges 1:27): "....the inhabitants of Bethshean and her towns". The site is on the path of a major south/north ancient road, depicted here as a grey dashed line. It is not far from the Jordan river, illustrated as a blue line. The cities and roads during the ancient periods, up to the Roman period, are indicated on the Biblical Map below. The area of the Jordan valley was fertile and populated during the early periods. 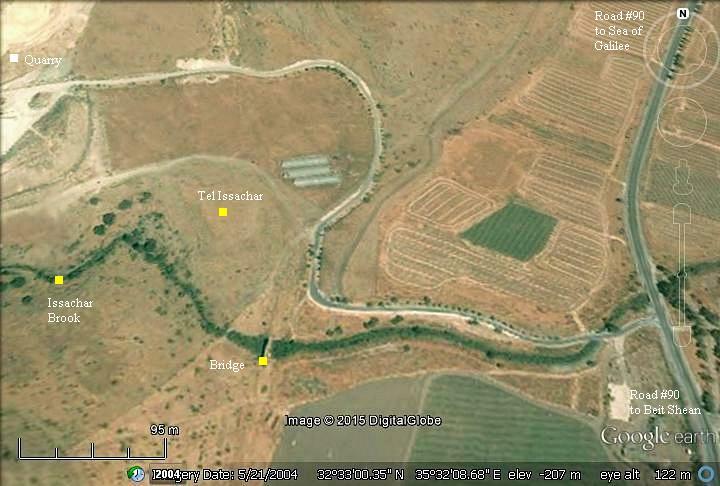 About 2.5km to the east of Tel Issachar is another ancient site named Tell Ishmael (Tell Isma'eil). It has twin mounds, one with remains dated to the Roman/Byzantine period, and the lower one has ceramic remains from the Chalcolithic, Early Bronze, Israelite, Byzantine and Early Arab periods. The survey identified ceramics of later periods, including Persian-period bowls, some ceramics from the Byzantine period, and glazed ceramics from the Early Arab period. A major Roman road passed on the east side. Many milestones of this imperial road were found around Beit Yosef, the nearby community. 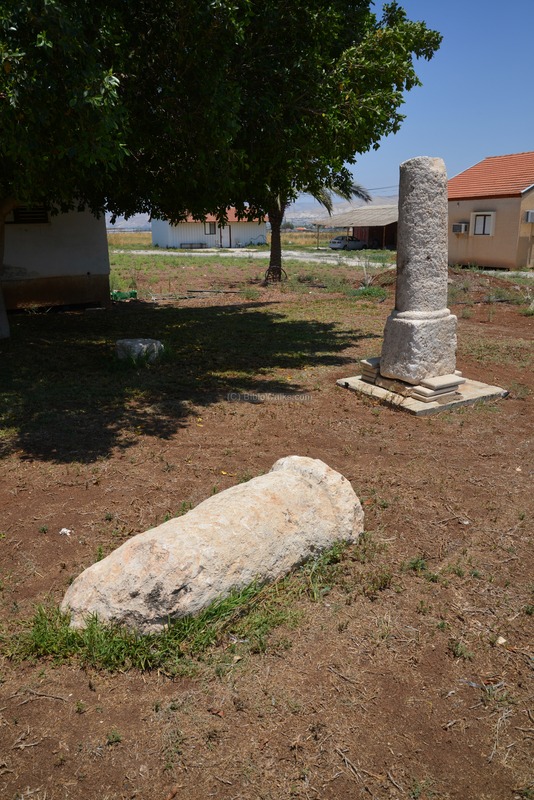 During the late Ottoman period a small village was located on the hill south of Tel Issachar. The map is part of sheet 9 of their survey results. Wady el Esh-Sheh is the Arabic name of Issachar brook, but has other names in its upper section (Wady Yebla, Wady Dabu). "Kh. el Esh-sheh - Foundations of buildings, apparently modern". 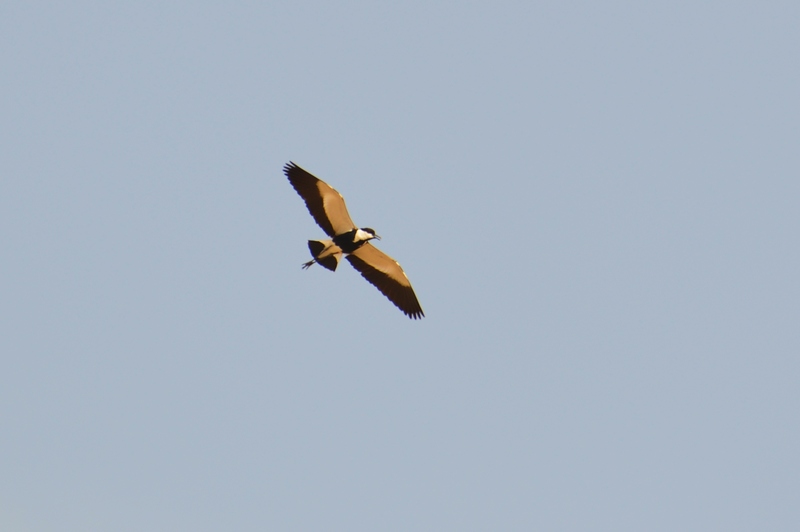 The translation of the Arabic name of Wady el Esh-Sheh is: "The valley of the nest". The map also shows a double-dashed road that passed east of the mound, marked as a Roman road. Its route follows the same route as the modern road #90. The Ottomans built a section of the Hejaz (Hijaz) railway from Haifa to Damascus, Syria, more than 100 years ago (in 1905). This railway linked the city and harbor of Haifa to Turkey and Medina (Arabia) until the Independence of Israel in 1948. Since then, it was dismantled and only few of the original rail sections could be seen. The Ottoman railway, now dismantled, passed on its east side. The nearby Moshav Beit Yosef was established in 1937. The area of Tel Issachar is open to the public and easily accessible. This aerial view above the site was captured by a quadcopter drone on May 2015. Issachar brook, with some water streaming on the south foothills of the Tel, is seen on the left edge. A closer view of the summit is on the next photo. The hill is relatively small (35 x 70m) and it is hard to regard it as a 'city', but in the ancient periods the Tel served as the "upper city", where most of the residents lived in mud brick houses around the central area. After thousands of years, only the nucleus remained visible. The round mound of Tel Issachar is located on the north bank of Issachar brook, which flows from the plains to the west (left) into the Jordan river on the east (right). This picture is a view to the north, taken from the railway bridge. A chalk quarry is located not far from the site, seen in the left background. It quarries chalk from a layer of marlstone dated to the Pliocene period (5.333 million to 2.58 million years before present). 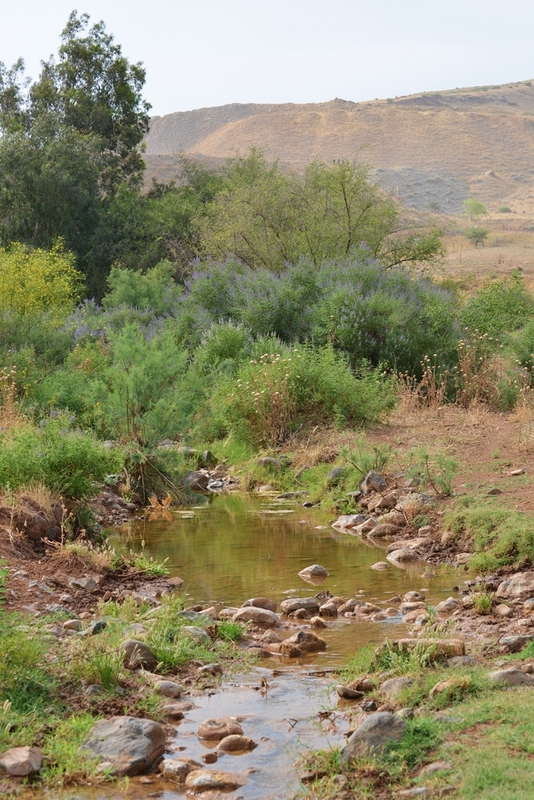 The Issachar brook passes on the south side of the mound, flowing into the Jordan river. Its drainage basin is up on the plains of Issachar. Issachar is the modern Hebrew name. The brook is also known in Arabic as Wady el Esh-Sheh , and its upper sections have other names (Wady Yebla, Wady Dabu). Hikers often walk through this valley up to the Crusader fortress of Kochav Hayarden (Kuwka Hawa). Issachar brook has a steady flow throughout the year, although during the summer it almost dries out. This photo was taken at the last week of May 2015, when the temperatures reached 40 degrees Celsius. At this time the weed on the foothills already dried out in the past 2 months, although this winter's rain was above average. The region of the Jordan valley, 200m under the sea level, is extremely hot and dry. 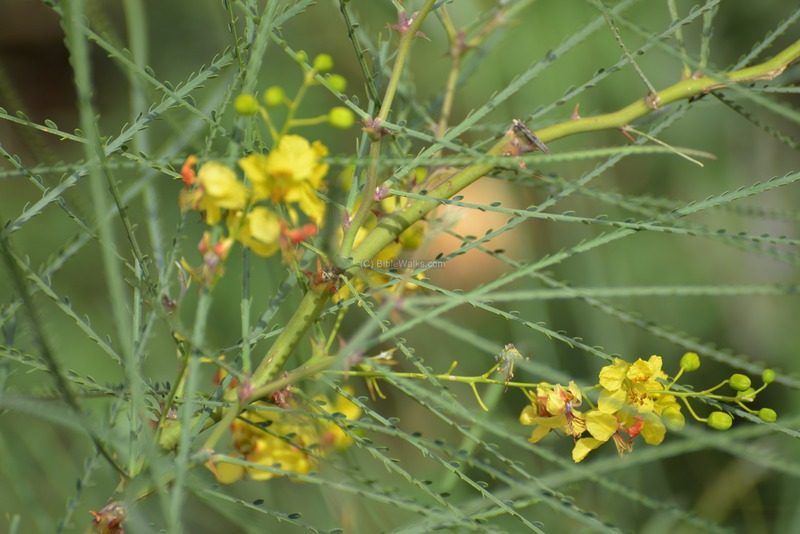 Along the brook are various types of wild plants. This bush, a native of the Mediterranean region, is called "Vitex Agnus-Castus", commonly named Chastetree. 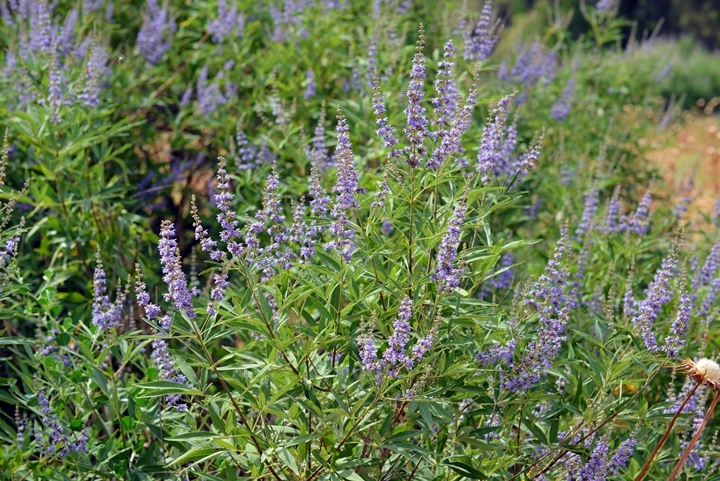 It is also named "Abraham's bush", as a tradition holds that this bush was the "thicket" that caught the ram that substituted the sacrifice of his son (Genesis 22 14): "And Abraham lifted up his eyes, and looked, and behold behind him a ram caught in a thicket by his horns: and Abraham went and took the ram, and offered him up for a burnt offering in the stead of his son". In alternative medicine, its berries and leaves are known as herbs for both male and female reproduction systems. 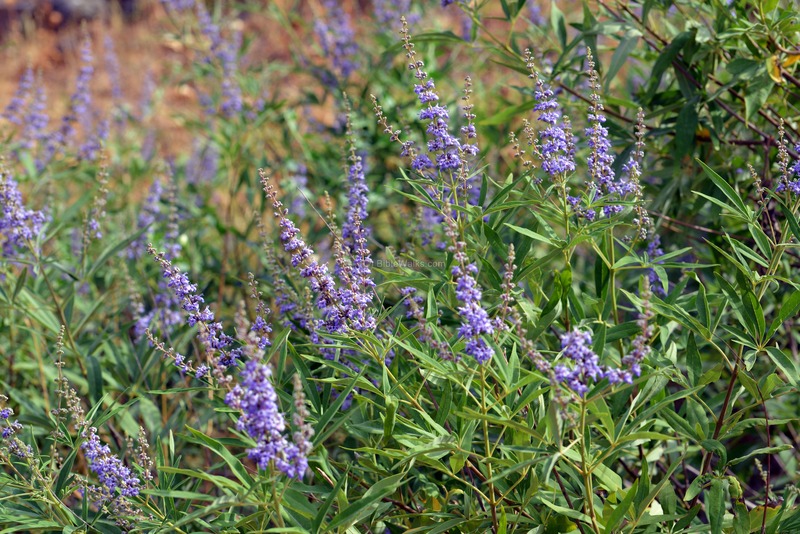 It is also used as medication for certain diseases. This gave it an alternative name of "Abraham's balm" (balm is a tree that yields a fragrant substance, which is also used as medicine). 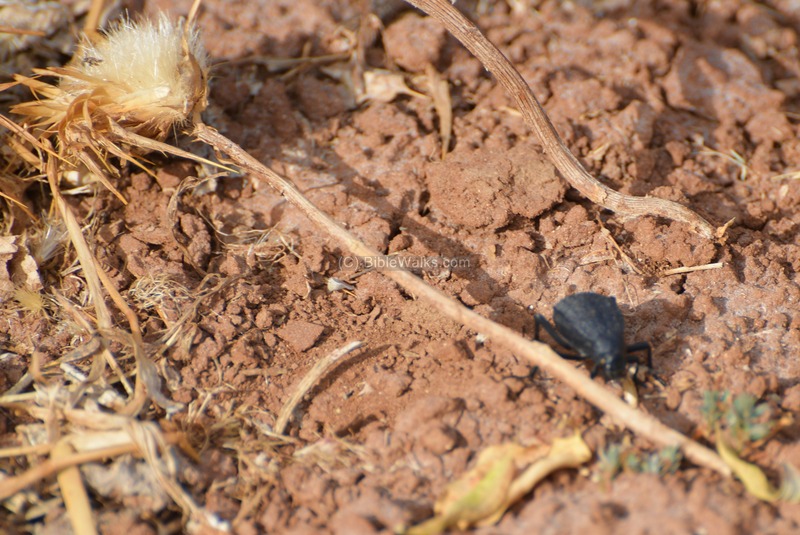 Turning to the insects world - a beetle walks along the dry soil. 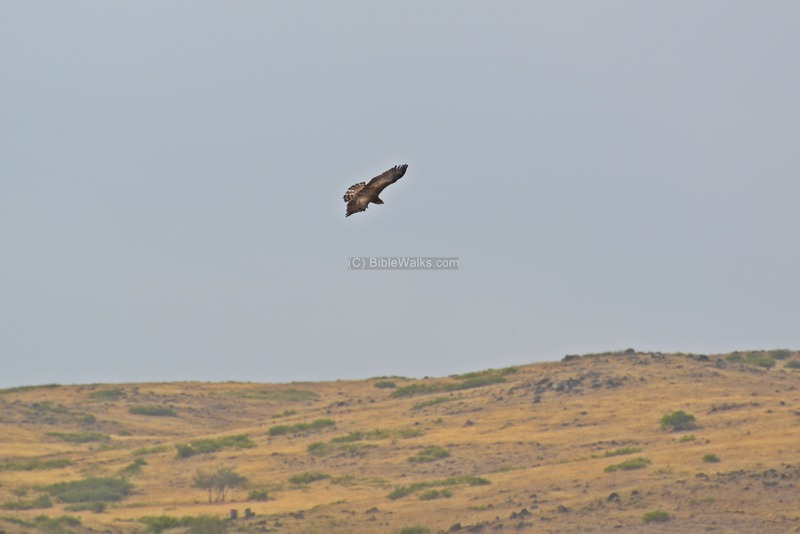 In the air there are various types of birds, such as the buzzard bird of prey. In addition to these resident birds, the Jordan river witnesses a staggering number of 500 million birds who pass it twice a year, as Israel is a main migration corridor between Europe and Africa. The old Ottoman railway passed on the east side of the site, connecting Damascus (north east) to Haifa (south west). On the north bound direction, it continued several kilometers to the north, where it crossed the Jordan river near Gesher. This aerial view shows the Ottoman period bridge, crossing Issachar brook. The bridge, based on these magnificent black basalt and white stone arches, was built in the years 1904-195. The rails are marked with the year "Cockerill 1903", produced by the John Cockerill Company - a Belgian iron, steel and manufacturing company based in the area of Liege. A major Roman road passed on the east side of the Tel. Many milestones of this imperial road were found around Beit Yosef, the nearby community. In front of one of the houses are two milestones, found by a local farmer in the 1980s. "Five milestones were found c. 500 m southwest of Bet Yosef; however, inscriptions were preserved on only some of them. 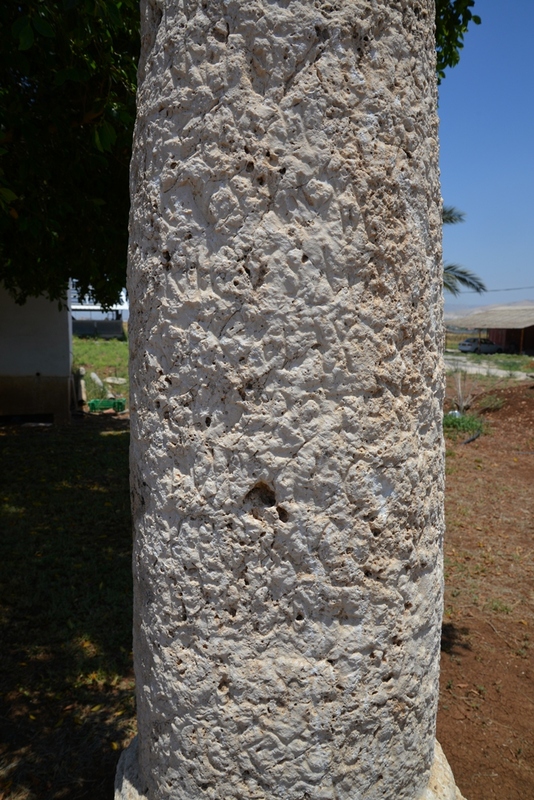 The following is one of the inscriptions:"
"Six milestones were discovered 1 km south of Bet Yosef, but they are embedded in the ground, and therefore the dates of them cannot be determined". The stone, which was erected during the reign of Commodus (2nd century CE), is now on display in the Bet Shean museum. The rest of the stones are now consolidated 200 meters north of the place where they were found. 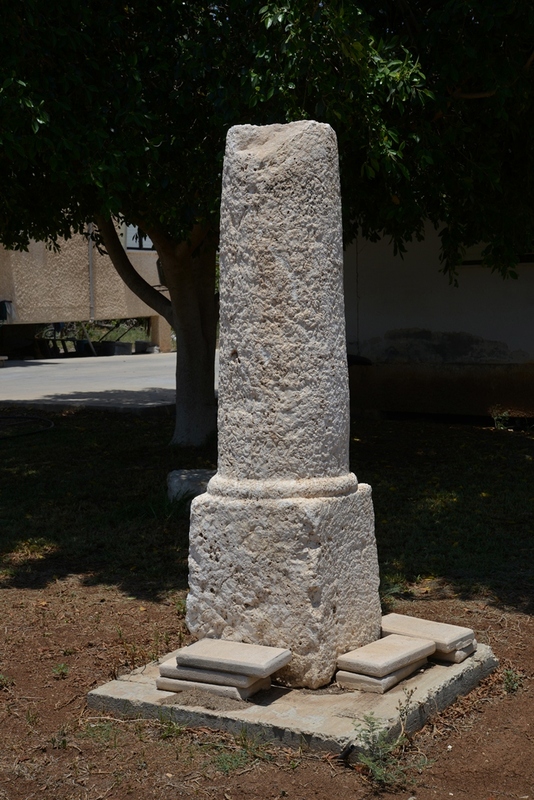 Thomsen (see Avi-Yonah 1949: 80) mentions that the third milestone from Bet Shean was in this spot, probably from the time of Constantinus II (292–306 CE)". These verses describe the area of the tribe of Issachar. "The fourth lot came out for Issachar, even for the children of Issachar according to their families. And their border was Jezreel, and Chesulloth, and Shunem; and Hapharaim, and Shion, and Anaharath; and Rabbith, and Kishion, and Ebez; and Remeth, and En-gannim, and En-haddah, and Beth-pazzez; and the border reached to Tabor, and Shahazim, and Beth-shemesh; and the goings out of their border were at the Jordan; sixteen cities with their villages. This is the inheritance of the tribe of the children of Issachar according to their families, the cities with their villages". Jarmuth with the open land about it, En-gannim with the open land about it; four cities". Tell Zeba - Zeba is a girl's name, meaning in Arabic graceful, adorned.